Contest is now closed -- stay tuned for a post on the winner! PJ Tool & Supply asked me to test out their new line of ImpressArt letter stamps. I chose one of their cool designer fonts, Ballroom Boogie, in lower case. 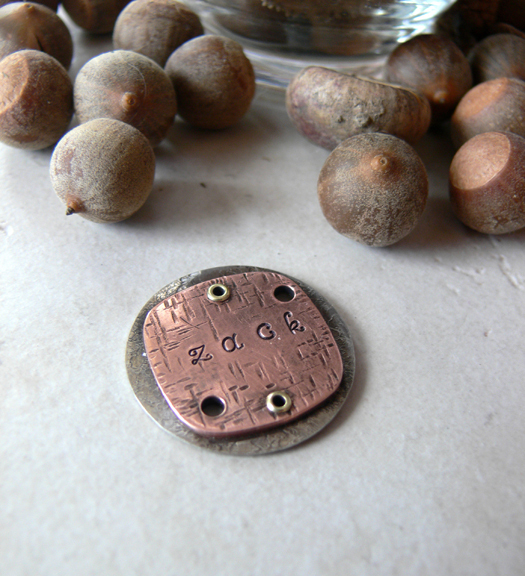 The letters are small -- 1/8" (3mm), so you can really get a lot of words on your stamped jewelry. This font is whimsical, including a-z and a question mark. The stamps are made of hardened carbon tool steel and can stamp precious metals, soft steel, aluminum, and even wood. My first test project is a bit unusual. I wanted to show you how to use letter stamps as pattern stamps. 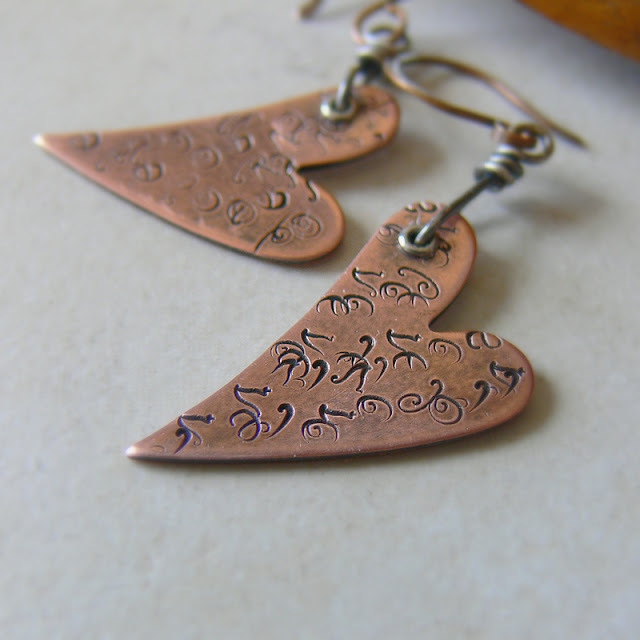 Using heart-shaped copper blanks, I used the letter stamps l, o, v, e, but instead of stamping the traditional "love", I randomly stamped the letters all over the copper. As you can see, the whimsical design of the four letters creates a super random pattern. Think of it as a secret message! After stamping, I used a silver tube rivet, then patinated the entire piece and polished it with fine steel wool. 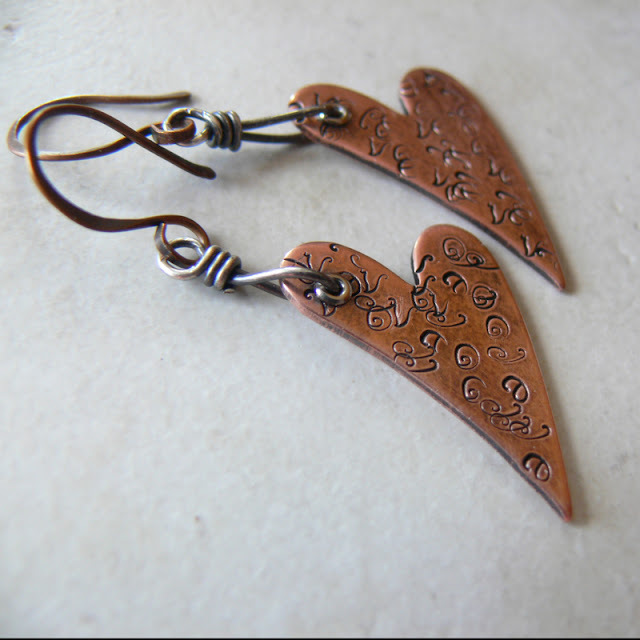 This leaves the dark patina in the stamped section, giving the earrings a rustic look. Oxidized sterling silver threaded through the rivets and copper ear wires finish the look. I call these "Secret Love". My last project is a personal one, a stamped name plate for a bracelet. 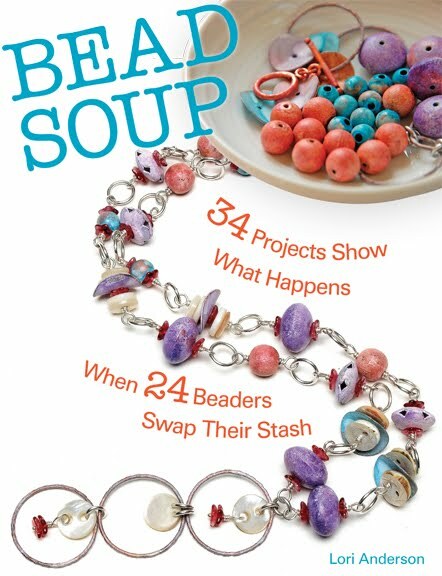 I want to make a bracelet (in alllllll my spare time!) for myself, and rather than a traditional "mommy bracelet", I wanted something really unique. 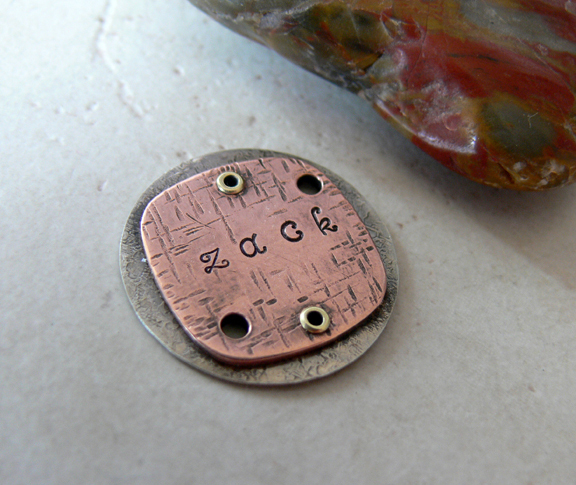 To that end, I stamped my son's name onto a piece of copper and riveted it with brass to a piece of silver. To make this, I used a texture plate to texture the silver, and after stamping the name, a riveting hammer on the copper to create cross hatch marks. I riveted the two pieces together with brass tube rivets, and then punched large holes for jump rings. (Confession time -- I goofed up -- the rivets should have been where the holes were and vice versa. But it'll work. Quirky is good). A patination bath, brushing with steel wool, and I have my own centerpiece for a name bracelet. I took this photo with acorns that Zack and I collected on our walks around our neighborhood. Now, I'm not a metal stamper. I've taken two classes where I stamped exactly two pieces. I tested these ImpressArt stamps a few times on a spare piece of copper for about three minutes before I made these pieces, and I'm pretty darned pleased with how they turned out. So ANYONE can use these! They're pretty, and even though the letters are small, they're easy to read. A couple of hard whacks with a 2-lb hammer is all you need to get a good impression. Now you get to own this set, a $70 value! First, let me thank PJ Tool & Supply for this opportunity. Please visit their web site by clicking here! 2. Extra points -- one for Twitter, one for Facebook. 3. Comment that you did these things, and the links to them. I know, hoops to jump, but guys -- these stamps are WORTH IT! $70 of fun for FREE! What a really Great Giveaway! Count me in 3 times ok? Im going to Twitter it, facebook it and Blog it! Thanks for this chance..a real Treasuretrove! wow! those stamps are cool, I have just recently gotten into metal work, and could really use something like this in my tools! Wow, what a great giveaway! I'd love to do metal stamping, but, of course, I need the stamps. I'd love to win! Might try to blog it but I've already done one for today and have one in the wings for tomorrow. I tweeted (studiomarcy) , posted on fb (marcy lamberson) and blogged- http://www.StudioMarcy.blogspot.com - set for Sat. morning at 5:30 a.m. Thanks so much Lori. What a fun giveaway. and I liked the way you did the L O V E on the metal. Very creative. Love what you've done with them!!! Have just bloged http://silverniknats.blogspot.com/2011/01/giveaway.html and tweeted! Lori, I AM so impressed! I cannot believe you did all this today in such a short time... the earrings are really cool. You know I love that rustic, mixed metal combination! And the focal for your bracelet is really great...it will make an xtra special bracelet!! You did wonders with this cool stamp set. I would love those stamps! Count me in. Awesome I SOOO want to win these! Love what you have done with the stamping set, the earrings and bracelet link with Zack's name are very unique. This is on my wish list, I would love a metal stamping set. I am going to cross my fingers. I have blogged and put a message on facebook. Great giveaway, Lori! I was just looking at stamp sets last weekend and resigned myself to keep working with my cheapie Harbor Freight versions for now as the cool ones are so expensive. I blogged about the contest and your blog at: http://actionalpha.blogspot.com/. I also added your blog to my followed blogs on Blogger - really love what you are doing here. Nice work on the earrings and pendant!! Hi! I love your earrings & bracelet charm! I want to win, so, I shared on fb! Oh, yes, I tweeted also! I'll be back with my blog link! Oh yes please!!!! I have blogged and facebooked it! Very sweet stamps! I would love those! Great giveaway Lori! I think that font is really quirky and fun. I am using stamps on clay and love it. I LOVE that you stamped the letters as a sort of cryptic message. Brilliant idea, really. And I so wish that I could get the hang of that whole riveting thing. In a class I did a great job with it and now I cannot rivet to save my soul. Thanks for sharing! Yes, I'd love to have these! What a great giveaway! I posted on fb and I'm planning on blogging about it, but I seems like everybody already has! Such a lovely and interesting font! Yay! So cool to do this!! LOVE the stamps! The designs are great! and someday I might tweet! Thanks for the link to our blog, too! And awesome earrings and focal you created with the stamps too - love 'em! dear lori, I've blogged & fb'd about this so consider those hoops jumped! (sorry no twitter) I love that you used the letters as design stamps, I've been doing the same thing w/ a couple of letters too. As per your request! Thank you again..
Wow Lori what an awesome giveaway. I have wanted to try stamping for soooo long but haven't bought all the tools as I just keep buying beads instead... I know silly me! Thanks so much again... fingers crossed! FANTASTIC! What a great giveaway! I also posted your giveaway on FB. Lori you will not believe this when I tell you I was just looking at a stamp set today and my thought was, "Well that will have to wait" ya know the funds.... So please enter me in your giveaway. I am posting on my blog FB it as well. Wow!~Absolutely love those earrings! I can see how addicting metal stamping could be! I blogged it, tweeted it and facebook'd it! yay!!! I posted both on my blog and to my FB page. Love the stamps, and what a terrific price! I love the earrings - so fun! The nameplate is great - my next class has to be riveting! I blogged about this amazing giveaway!! and my on my Facebook Tracy Sult Bell. Sweets you rock! What a cool font! I blogged about it (with links of course! ), facebooked it, tweeted it and will do so again this is a fantastic gift to people! I've blogged about this give away, and posted onto my personal facebook, and Treasures by Terry facebook. I was seriously just looking into purchasing my first set when I happened upon a post on FB about your WONDERFUL giveaway!!! Oh, man (said in a very whiny voice). You are just going to force me to blog, aren't you? Well, I'm not eligible for this either. I think I need to go get some cheese with this whine. Love your new bracelet! LOVE it! I tweeted about this awesome giveaway too! This is a fantastic giveaway, I would love to be the winner of this! Love what you came up with...I have one measly stamp of a heart, so I'd LOVE to win these. as well as on my facebook page! on my Facebook page at CB&CO, and on Twitter! Thanks again! on my Facebook page at CB&CO, and on Twitter under Coliebugbeads. Thanks again! This is a fabulous giveaway! I'll let someone more deserving of it win it but I just wanted to stop here and say how much I love what you did with these! Got three comin' up!Love your work on this blog, Lori! What a pretty set! And I love what you did with it. What do you do to form your eyelets? They are very nice! Count me in too! This is an awesome and very cool opportunity! Thank you Lori for being so giving! I blog, facebook and twitter it! BTW...those were some cool things you created especially the earrings! You made such great pieces! I'd love to try m y hand at metal stamping, too. Hi Lori! I WANT these!!!!!! Thanks for this wonderful giveaway. I hope I win!! How generous of you to give these away! I have wanted to add metal work to my jewelry designs. The pieces you created are wonderful. I'm so inspired thank you. I have blogged about it and put it on our Facebook page. You are to good to us! Hi Lori! Love what you are giving away!! I really hope I win this one!! I have been wanting some forever!! Wow, what a great giveaway! I love the pretty things you made too, makes want to get me a mallet and something to hammer on straightaway! OK posted to blog and Facebook! This is so great of you! and they look like so much fun! 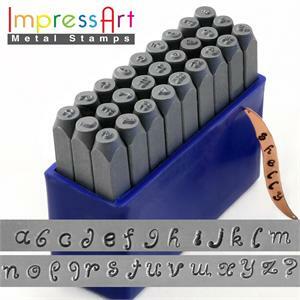 This is the funkiest metal stamp set that I've seen ... I've just got to have it! I've been doing some metal work - but really getting into it. Can't wait to win this! :D I posted info about it on my blog myranmike-soulstrung.blogspot.com and I facebooked about it twice too - myrahardinmcdaniel@facebook.com http://lorianderson.blogspot.com/2011/01/metal-stamp-giveaway.html) ... once with your article and once with my blog article. I'm soo excited! Truly! :D Let's win this thing!!! I would LOVE to win this giveaway! 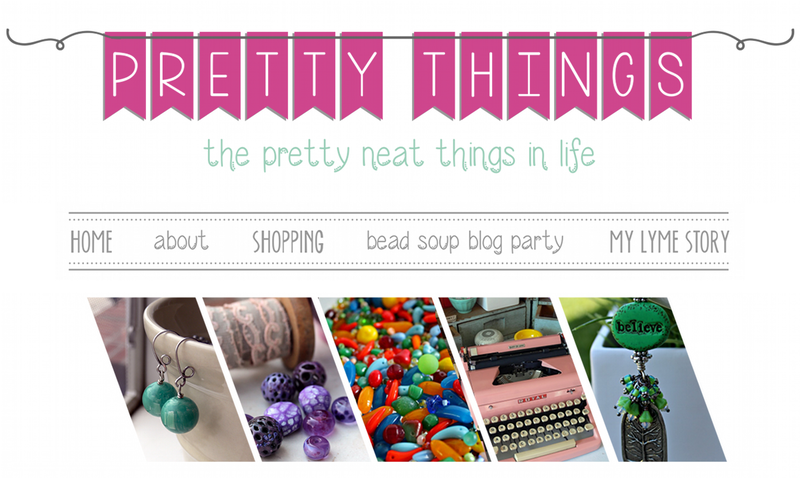 I just blogged about it! I shared this on my Facebook fan page!!! Hi I'm a new follower. This is a really great giveaway. I put this on my blog. I would love to win this set. I've just started stamping on metal and need some stamps. Just tweeted it. Just posted about the giveaway to my facebook. And I posted on Facebook and Twitter! Please enter me in the drawing!! I love the earrings you stamped. Tool set looks so nice. I have tweeted and blogged your giveaway, blogged first so it tweets automatically as I checked it out..
and my blog is connected to facebook so it will post your giveaway too. But I can post it another way to FB, too. it would be so nice if people would play nicely without triple posts here..
What a great way to start out the year and I never really would have thought to use a letter or two as a design pattern. I Tweeted on Twitter. http://www.twitter.com/creationsbytee and Posted on my Facebook Page ie Teresa Hall. Count me in on this cool and different giveaway! I love how you used these wonderful stamps! Would love to win these! Wow, a lot of people must want these stamps--you've got a ton of comments here. So I'll just add mine. Thanks for the opportunity! Great examples for inspiration you have shown us! I hope it's not too late to enter! Thanks so much. ^__^ Someone is going to walk away very lucky indeed! What an awesome giveaway! Thank-you so much for the chance! I love fonts! 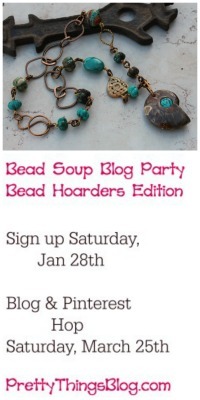 I just blogged about your giveaway and put a link back to your blog. I did it! I jumped through all the hoops because I really want these stamps!! I'm just getting started with metal stamping and I've been drooling over these for awhile now! Couldn't remember, but I tweeted about your giveaway. Glad I saw this post! Count me in blog, tweet and FB. Your hearts look amazing and the rivets add a nice finish along with function. I like that you didn't add more stuff like beads chain etc. Nice. I posted a link on my facebook page! I'd love to add a new dimension to my work with stamping. 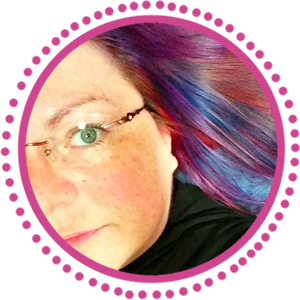 I am joining the party - and have blogged and facebooked about it. I have a stamp set, but this is so cute and whimsical, I think it would be a great addition to my tool set. And also I facebook it!!! Thank you for visiting my blog which lead me to yours just in time for this great giveaway...I love PJ Tool and have used them myself. Love the stamps you selected for this giveaway - score! I have added your giveaway to my blog! I have added your giveaway to my facebook page. Love your blog and hope I win! I have posted and will facebook it too. I have blogged and facebooked....I hope I win, I have wanted one of these sets. LOVE your blog and your work...so glad I found it! I would love these stamps! Here is my facebook comment..not sure how to share the link other than this. I love the way you created the pattern on the hearts. That font is fab as pattern stamps! I've used letter stamps to make patterns, but that was just a simple set that I used for a border made from S and I -- nothing at all as pretty as this. Of cause I want a chance to win this set -- I don't own letter stamps but these fonts are just so fab I *must* get some. Thanks for doing this Lori. Those are the most awesome stamps! I blogged about it on my blog www.dragonsglass.com and tweeted @dragonsglass. I also posted it on my facebook. I just wanted you to know that I also commented about this giveaway on my blog! WOW I just found PJ Tools and ordered a few sets last week!! I would LOVE to have this set though!! It was on my wish list!! I am super excited for this!!! and I facebooked a link too. Too bad I don't twitter. This is a great stampset. Very Cool! Here is the link to my blog post. I love words and letters, so good luck to everyone and fingers crossed. you have a great site & beautiful jewelry! thanks for the great contest! oopps............will post on my blog: http:lindaloveschocolate.blogspot.com and on my facebook page. Thanks Lori and PJ Tool & Supply for the great giveaway opportunity! I blogged and FB'd today. Would love to win this set! I tweeted and blogged about the great giveaway! thanks for the opportunity! What a great giveaway!! I would love to win these. Awesome! I've kinda been thinking about trying some stamps! I posted on my blog! :) Thanks for the opportunity to try to win! This is an awesome giveaway!!! I have always wanted to try out stamps!!!! LOVE this font! I also love the site that sells them and have bookmarked them as well. Thanks so much for doing this FABULOUS giveaway! I facebooked about this too. Wow what a great way to use the power of Networking to draw people to your blog!